On October 25, 2012, Wietse Venema was inducted into the ISSA Hall of Fame, at the 2012 ISSA International conference in Anaheim, CA, USA. Quoting a nomination document, "Hall of Fame is a lifetime achievement award recognizing an individual's exceptional qualities of leadership in their own career and organization as well as an exemplary commitment to the information security profession." 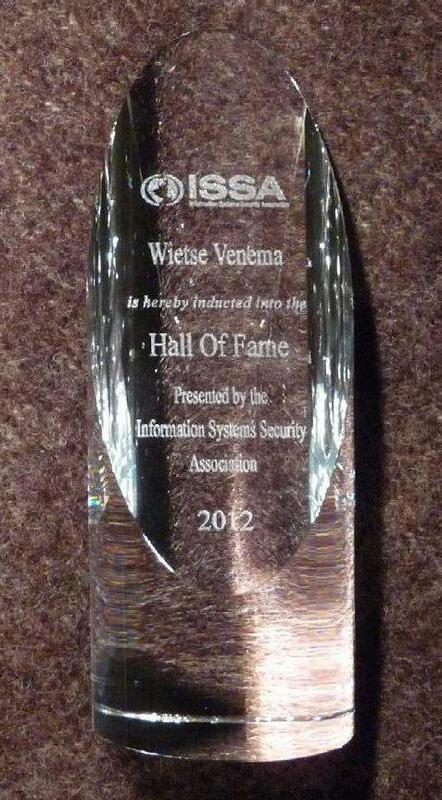 With this award, Wietse joins several well-known names in the security community. The award is a glass cylinder, approximately 7x19.5 centimeters (2.7x7.6 inch). It is surprisingly heavy. Click on the image for a larger view.